Part memoir, part cultural exploration, this book covers the author's journey as she grows up in an evangelical Christian home, leaves religion behind as a young adult, and goes on to raise children in a family outside of religious belief. 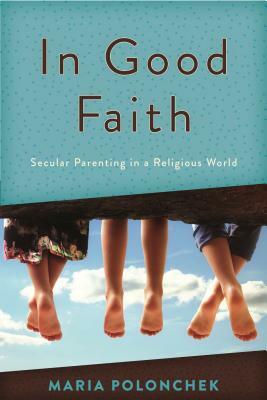 Maria Polonchek weaves a personal story with up-to-date studies and philosophic exploration of what it means to raise secular children in an otherwise religious world. Offering careful and respectful advice for other parents who are raising their children outside of a particular religious belief system, she explores the many other ways of instilling identity, belonging, and meaning into our lives and the lives of children. Honest and irreverent, the author admits to her religious "baggage" and searches for better understanding of such topics as religious education, morality, awe, death, purpose, and meaning, and tradition from secular perspectives. She interviews experts, looks at various studies, and turns to a variety of sources for answers, while maintaining a casual and personal tone. While she ultimately argues for parents to let their children shape their own beliefs, she encourages families to tend to existential and social needs that sometimes go unnoticed or unconsidered in life outside religion. Maria Polonchek is a Kansas native living in the San Francisco Bay Area. She has published award-winning poetry, short stories, and essays and began writing extensively on the motherhood experience after having twins in 2005. She now has three children and has written for the literary magazine Brain, Child, contributed to the anthology Have Milk, Will Travel, and has chronicled her experience parenting outside religion for The Greater Good Science Center, The Friendly Atheist, and Brain, Mother. In addition to thinking, reading, and writing about parenting, she is passionate about wellness, mindfulness, the outdoors, music, art, and the way all of these things relate to issues of social justice.